It's rush hour in Philadelphia for thousands of baby toads. They hop across a busy street on a rainy summer night. Why do toadlets cross the road? To get to the woods on the other side. That is where they will live, eat mosquitoes and grow up to be full-sized American toads. After a couple of years, they'll make the reverse trek as adults unless they get squashed by a car. The Schuylkill Center for Environmental Education sets up a roadblock each year. It reroutes cars so the amphibians can cross the two-lane street without fear of, um, croaking. The cycle starts in early spring. Adult toads, which can fit in the palm of your hand, emerge from the woods to breed. They cross Port Royal Avenue, scale a 10-foot-high embankment and then travel down a densely vegetated hill. Their offspring each about the size of a raisin make the journey in reverse about six weeks later. 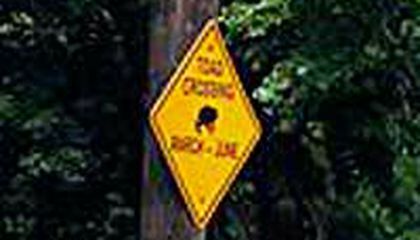 The detour program began in 2009 when a resident noticed the toad-filled road. City officials later granted permission to close the street for a couple of hours every evening during both two-week migration periods. Though some will inevitably be squished when the roadblock is not up, the toad population is not endangered, Morgan said. But protecting wildlife is important, she said, and residents seem to support the project. I think its nice there taking consideration of the toads but i never seen a toad so small before it looks wierd and strange because its so small. People in Philadelphia have requested that a roadblock be put up in front of a street where during a certain time of the year for several weeks toads cross the road frequently to mate and baby toads cross to get home.The road block started when someone noticed all the toads crossing the road and didn't want to smash all of them by driving through.Officials agreed and allowed for a rock block to be set up during the season for several hours at night,during that time volunteers go out and help the toads and baby toads cross the two lane road.Baby toads are as small as raisins and adult toads can fit in your palm.I think it's really nice that they put up a road block so all the toads aren't driven over . This is amazing. They put up a detour just to lye the toads pass safely. I think this is a great thing to do. It helped them survive. This is a nice city let the toads cross without gettteing hurt and just let them pass! ! ! ! !! ! ! !!! !! ! ! ! ! ! ! Some people in Philadelphia have requested that a roadblock be put up in front of a street where during a certain time of the year for several weeks toads cross the road frequently to mate and baby toads cross to get home.The road block started when someone noticed all the toads crossing the road and didn't want to smash all of them by driving through. These toads are extremely small and can die very easily.Officials agreed and allowed for a rock block to be set up during the season for several hours at night,during that time volunteers go out and help the toads and baby toads cross the two lane road. I think this article is very interesting because people are being catious about animals and loving nature. It is funny and weird that they put up the sign but it was also a good thing to put up that sign. If they did not put up the sign then a lot of baby toads could have died by cars. 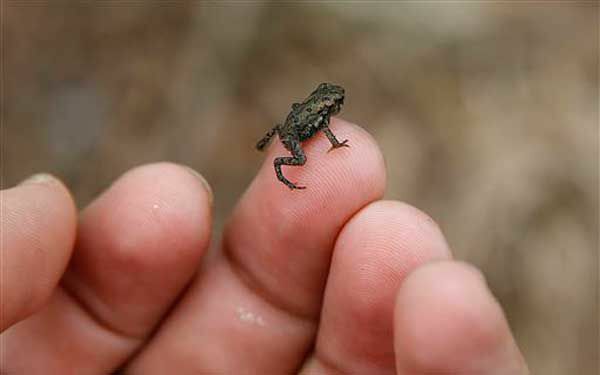 But when I saw the picture I did not know that baby toads where really small like little tiny bugs. So that is why people in the cars can not see them and they just run over them. But I wonder if they made the sign handmade or did they buy it at a store? They probably bought it at a store because it is shiny. So now I think that now when people see the sign they would not run over baby toads now. I think this is awesome to see that people want to protect the baby toads that are hopping their way towards their natural habitat. It is good that people are being more aware of the baby toads now that they have to cross the street to enter their natural habitat at the other side of the street. Answer: People should go out of their way for baby toads because the toads can be run over by a car accidentally because they are so small. Yes, toads benefit people by making them more aware of the toads every spring so they do not run over the toads. In Philadelphia, thousands of baby frogs hop across the road to get to the forest on the other side. Later, they will return to the other side as full-grown adult frogs. To make the trip safer for these toads, an environmental center set up a detour for the frogs to cross without getting hit by a car. The baby frogs are about the size of a raisin. Some frogs will still get squashed when the roadblocks are down, but they are in less danger than before. This is good for the frogs but doesn't seem very good for locals. People have things to do, places to be. I think that the idea of a roadblock for the amphibians to cross is a brilliant idea. By using a roadblock, amphibians have a place that they can safely cross the road without getting hurt. I think that from now on amphibians won't be extinct becuase there is going to be a roadblock for them to be able to cross the road. Answer: People should go out their ways for baby toads because recently they have been dieing. People benefit from toad becuase toads eat flies and other bugs. I think it's a great idea to have a detour to let toads cross the road. I love toads! I wish I was there to help them all cross the road. When my dad and I go hiking we try to find little frogs everywhere.